Band Of the Day is the world’s first daily music magazine built solely for mobile devices. Surpassing traditional music magazines, Band of the Day delivers a new artist or band every single day through expert curation and engaging reviews, as well as full streams of the artist’s top songs, videos, photographs and more. A new band in your pocket, everyday. Listen, Discover, Share. 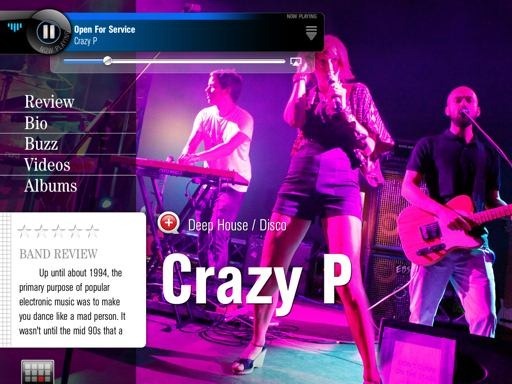 Right off the bat, that’s a very cool concept for an iPad app. And happily, it is tremendously well executed in Band of The Day. I’m always on the lookout for new artists, bands, and music. I’m hugely fortunate to be able to work at home and listen to whatever I like all day long (the Deputy Editor Dawg gets no say) – so good music discovery apps always have huge appeal for me. Band of The Day is one of the best I’ve seen. Aweditorium has been my favorite in this area for a long time, but after a few days with Band of The Day it has become my favorite app of this kind. — The app’s interface is super simple, slick, gorgeous, and just a joy to use. 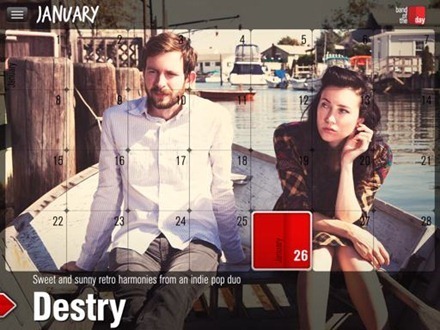 You just tap on a day of the month to bring see a photo and brief description of the featured band for that day. — The pages for bands are superb – the sections for each band include Review, Bio, Buzz, Videos, and Albums, and of course the pages are gorgeous. 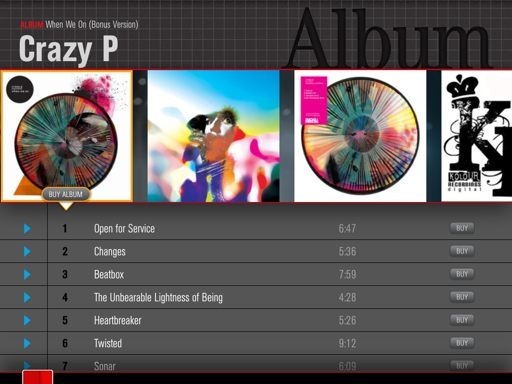 — While you go through the pages for an individual band, you tap the Play button to hear featured tracks as you read and browse. — The controls and navigation throughout the app always feels elegant and natural. Even the sharing button is a simple red + sign with a popout to share via Twitter, Facebook, or email. — The Albums section offers a very nice top slider showing each album, with track listings for the selected album below; as well as preview buttons for each track as in iTunes, and links to buy albums. 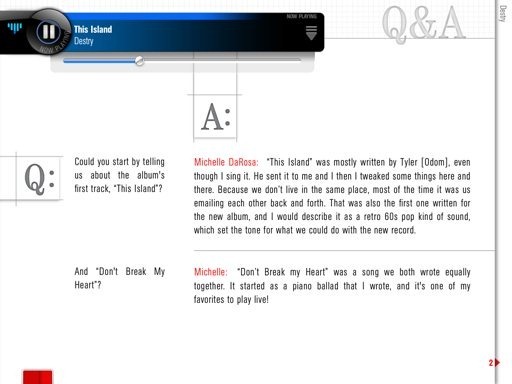 — The pages for some bands have a Q&A section. — The app has support for AirPlay audio and video, so you can listen to and watch your favorite bands from it on a big HDTV if you have an Apple TV. 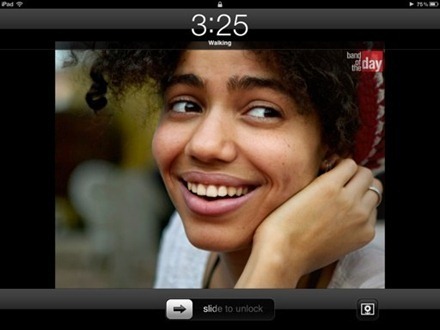 It continues playing songs in the background when you switch away from the app, and when the iPad goes into sleep mode. — All of the above are things that make this an app that’s a pleasure to use. By far the best feature of Band of The Day though is the excellent selection of music included in it. I ended up buying three tracks by the very first artist I listened to in the app. And it only got better from there. 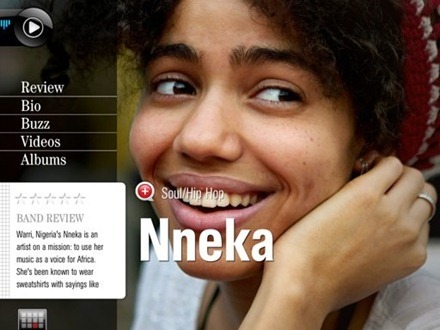 Later on I discovered Nneka – a Nigerian-German soul singer and songwriter. She’s got an amazing voice, reminds me a little of the wonderful Macy Gray, and I’ve already bought a full album of hers and some other singles by her. If you like discovering great new music and excellent free iPad apps go grab this app as soon as you can. 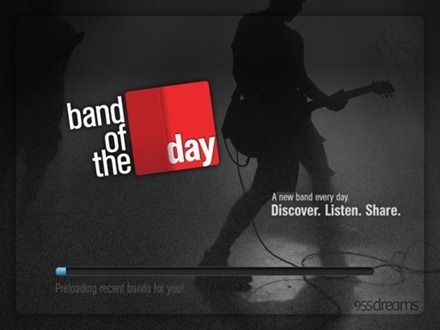 Here’s an App Store link for Band of the Day for iPad. Very Cool! Will definitely check out and review!